Right off the bat, I have to admit the Apple TV 4K is more aesthetically pleasing than the Cube. Where Apple decided to use rounded corners to create a discrete device, Amazon has opted for a sharp-edged cube with a light strip on the top. On the bottom of the Apple TV is a fan for better cooling, a place where Amazon decided to place a speaker for its built-in Alexa to speak through. 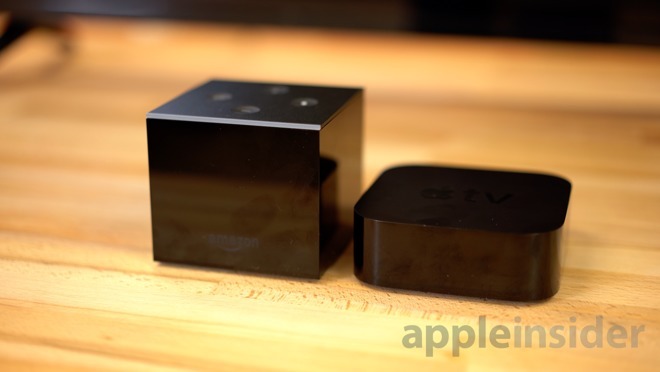 On the top, the Fire TV Cube has eight microphones for voice control, and four physical buttons including a mute button, whereas Apple added black-on-black branding. Around the back of the Fire TV Cube is a plug for the included infrared blaster, which is used for controlling third-party devices with just your voice. There is also a micro-USB port that can be used with the included Ethernet adapter, but it's connectivity is limited to 100 Mbps compared to the Apple TV 4K's built-in Gigabit Ethernet port. Amazon is currently offering the Cube for $120, or in a bundle with Amazon's Cloud Cam for an extra 80 bucks. The pair sync automatically, with the security screen displaying on the television after just a brief wait. This feature, unfortunately, isn't available on the Apple TV 4K. 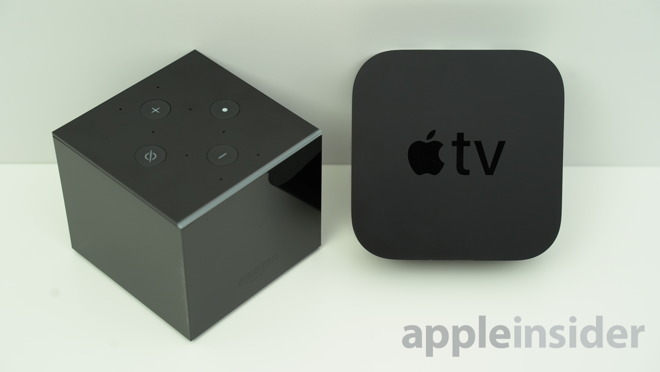 The Apple TV 4K starts at a higher $180, but it is supplied with twice as much storage as the Cube, as well as an extra gigabyte of RAM. Pay just $20 more for another 32GB of storage on top. So, what makes up the difference in price? For starters, the Fire TV Cube is simply last year's Fire TV combined with an Echo Dot. When bought separately, the two devices total a similar $120, however Amazon is currently selling the pair for $95 if you buy them together. The Fire TV has the exact same internals as the Cube, other than the storage. It can also do pretty much everything the Cube can do if you've got an Echo, but it can't turn on your TV and control devices like your cable box. The Apple TV 4K's price tag is justified by its A10X Fusion processor, the same chip used in Apple's latest iPad Pro models. The A10X is so fast that it matches the performance of some of Apple's new MacBooks, especially when you look at graphics performance. The Cube has a chipset that's made with architecture dating from 2012. You get the same processor that comes in the Raspberry Pi 3, except clocked at a slightly faster 1.5Ghz speed, while the graphics chip is an ultra-low power GPU meant for entry-level phones and wearables. 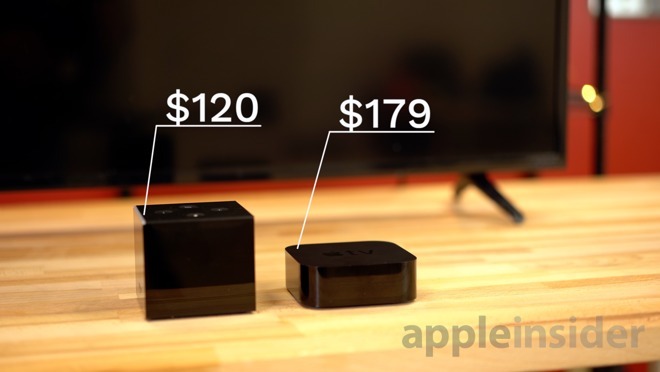 No wonder Amazon's selling the Fire TV Cube for $120. The Apple TV 4K has 3GB of RAM, 50 percent more than the 2GB used in the Cube. Both devices support 4K video at 60 frames per second and HDR, except the Cube only supports HDR10 whereas the Apple TV 4K also supports Dolby Vision, a better version of HDR. The Cube already supports Dolby Atmos surround sound, and the Apple TV 4K will catch up when tvOS 12 gets released this September. 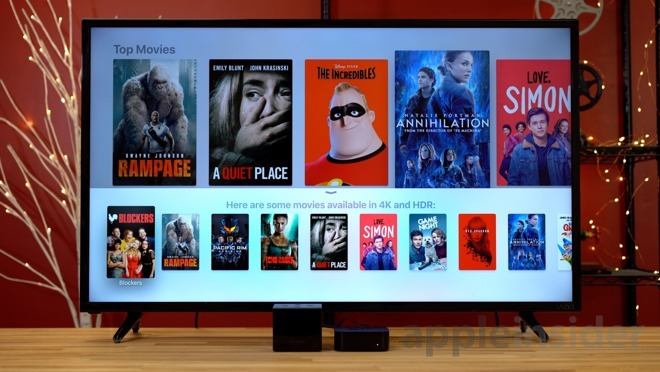 Apple will also automatically upgrade supported iTunes movie purchases to Atmos versions for free, just like it did when Apple introduced 4K movies to the store. There's also a bunch of new features being added with tvOS 12, including third-party Siri Remote support, Password autofill, zero-sign-on cable and more. The Cube will soon support sleep timers, Alexa Calling & Messaging, multi-room music, and Bluetooth connections to mobile phones. 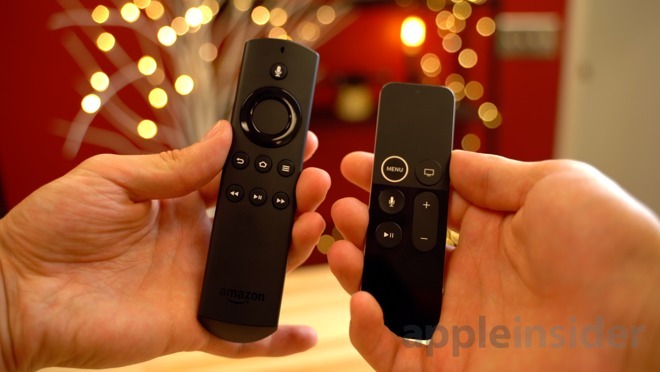 The Siri remote's metal and glass construction tops the Alexa Voice Remote's plastic handset. It's also got a built-in battery that fast-charges via Lightning, versus a couple of batteries on the Alexa Remote that many reviewers say drain too quickly. Amazon's remote also lacks volume controls, so you'll have to resort to finding the TV remote or asking Alexa to turn up the volume. The issue with using Alexa for this is that you can't specify a specific volume, and the volume increments max out at 10 units, so users will have to ask Alexa multiple times to get to their desired volume. Thankfully, the Siri remote has volume controls and a touchpad, making navigation a lot quicker than using the buttons on the Cube's remote. We love that you can ask the Cube to turn on your TV or other connected devices like an Xbox, Playstation, or cable box, but while Alexa is a lot smarter than Siri, searching for movies and shows is a pretty bad experience. A search for newly-released rentals brings up a list consisting mostly of Prime movies. TV shows are offered when searching for action movies, while a request for "top-rated movies" gave a general movies list. The Prime movie results were very limiting compared to what Amazon offers overall, and if you search for a certain category of Prime movies, you end up with a bunch of non-prime content. Luckily, searching for movies by actor or for films made by a certain director works well. You can also use your voice to scroll through the results, but it takes forever compared to using the remote. The worst part about Alexa is that you can't search specifically for 4K or 4K HDR movies. Alexa will simply search for movies in general, regardless of resolution. On the Apple TV 4K, every search result is completely accurate. From searching for 4K movies to 4K HDR movies, to action movies and action shows, you get exactly the results you want every single time. The best part is that every 4K HDR movie available for rent is available to rent in 4K HDR, whereas on the Cube, there's a lot of movies that you can purchase in 4K HD but can only rent in regular HD quality. On top of that, there's more new releases on Apple's iTunes that allow rentals compared to Amazon Prime, like "Black Panther," "Peter Rabbit," and "Passengers." Interestingly, the Cube has a 4K movie only available as a $25 purchase, even though it's available to stream on Netflix. The Apple TV 4K instead takes you straight into Netflix to watch the film. Searching is also incredibly quick on the Apple TV compared the Cube. It happens instantly, and you can get more search results by scrolling right, whereas the Cube limits you to a maximum of 99 results. 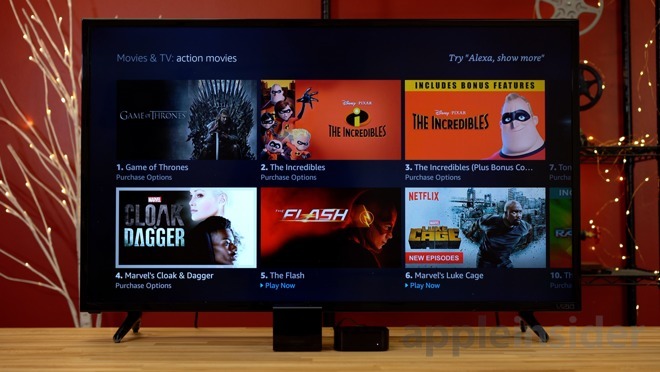 The Apple TV 4K's user interface is also smoother than the Cube, which will sometimes lag and take time to load certain apps or initiate search results. One plus for the Cube is that you can watch 4K content on YouTube, which won't work on the Apple TV since it doesn't support YouTube's VP9 codec. Both devices work well within their own ecosystems, like movies, photos, and music. Whichever ecosystem you've invested more into may be the better option for you. The nice thing about the Apple TV is that you can AirPlay content to it straight from another device, such as to show others photos and videos. The Cube can't currently do that without third-party software. Apple TV also has podcasts, which works very well and is convenient for home listening. When it comes to games, you get a better selection of titles with higher quality graphics on the Apple TV, thanks to its powerful processor. You get mostly basic Android mobile games on the Cube, and when using voice to search for them, you get hundreds more results on Apple TV. When you're not using your devices, you also get better screensavers on the Apple TV as well. Overall, the Apple TV 4K is the superior streaming device, except for the fact that it lacks hands-free voice controls. However, the Alexa voice controls on the Cube are so bad that you'll have to resort to using your remote for many activities. The Cube does gain some pluses for being able to turn the TV on and control other devices, but it's not that big of a deal for a lot of people. Lastly, if you're looking for the best 4K HDR experience, the Apple TV 4K has a lot more content to offer for the moment.